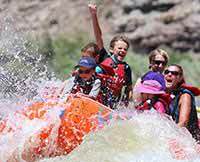 Desolation Canyon Rafting – Green River, Utah – I will never forget this trip! We could not have asked for better guides. Our team leader was extremely skilled and in total control. The other guides constantly made sure that all of our needs were met and then some. I still marvel at how well the trip was planned and organized. AWESOME!!! I WILL NEVER FORGET THIS TRIP. This was my first camping experience. However, when you are eating shrimp cocktail followed by a luscious steak dinner and ice cream for desert your perspective becomes somewhat skewed. I will never forget the Plane ride to the plateau, the Geology, the history, the rapids, the camping and of course the guide who made all the difference. THANK YOU!!!! for a once in a lifetime experience that I hope to do again and again.